Sharing his thoughts with Finance Magnates, FXCM Drew Niv explains why retail forex traders are able to source optimal pricing. Last week, FXCM published a report comparing the execution quality experienced by customers compared to available pricing on the inter-bank markets as well as for FX futures traded on the CME. Chief among the findings was that for the period between October 1, 2014 to August 31, 2015 FXCM customers experienced fills better than prices quoted on the CME 86.47% of the time and 92.19% better than interbank prices. To gain more understanding of the purpose and timing of the report, Finance Magnates spoke with FXCM CEO Drew Niv on the subject. With regard to what led to conducting the analysis, Niv described that there are two main audiences: retail clients and regulators. Niv explained that there is this misconception in the market that institutional customers are priced better than retail traders, stating “retail trader chatter believes they are getting lousy pricing, and this is a common misconception”. Niv added that among industry professionals, everyone knows that retail pricing is superior. Niv explained that the industry works in such way that different segments are priced differently. As a result, liquidity providers are able to price better to FXCM’s customers knowing they are retail customers, compared to anonymous markets like EBS and the CME. As such, FXCM is hoping that their findings will dispel the notion among retail traders that their executions are worse than that available to institutions. Secondly, Niv explained that they wanted to show to regulators that forex brokers can price customers better than the prices available on exchanges. As such, by publishing execution data, FXCM is aiming to confront the regulatory chatter regarding OTC products moving on-exchange that began with swaps and NDFs becoming mandated to trade on SEFs. Niv explained that one of the biggest problems with the OTC to exchange argument is that there hasn’t been any data published to counter this trend, stating: “The reason that no one is countering this is because no one is publishing data.” Niv added that “banks can’t publish data since they price differently” and the result is “a one sided debate”. When asked if US regulators will even care, as the consensus among forex professionals in the US is that the CFTC and NFA are singling them out, Niv answered that the “goal is to open up the dialogue”. Niv cited that beyond just FXCM, he believed the entire US retail forex industry is offering better pricing than exchange equivalents, and that regulators need to become aware of this. As an example, Niv explained that simple items such as retail brokers pricing in five decimals compared to four on exchanges isn’t something that is checked by regulators. As such, FXCM’s stance is that the more data available to the public, the greater the possibility of true debate on the subject of forex execution quality. Next, we wanted to know why a hybrid solution such as LMAX that operates a Multilateral Trading Facility (MTF) isn’t viewed as the optimal model for the retail industry. In theory, an MTF provides the benefits of an open order book like an exchange and public pricing that can be geared specifically to retail customers. Niv countered that the drawback with LMAX is that while they offer tight pricing, liquidity is low per instrument. This is the converse of interbank ECNs such as EBS where liquidity is massive, but spreads are wider. As such, Niv didn’t believe an MTF is a true comparison to the available liquidity that FXCM or other large retail brokers can source for their customers. How about larger account sizes? I then asked Drew Niv if he believed the industry will move in a direction of regulators enforcing larger minimum account sizes. According to FXCM’s own analysis they found that larger sized accounts far outperformed smaller ones. Niv answered that the “problem is that this can be said for all asset classes” which see smaller size accounts for trading products like stocks perform equally poorly. Niv added that “people like to trade small cap shares because of the volatility”, even if net profitability trading them is poor. As such, Niv stated that he doesn’t believe regulators will ultimately apply such restrictions to forex. While not likely to occur in major jurisdictions, Niv cited how changes in South Korea have more or less killed forex trading. In that country, regulators created a minimum lot size of 100,000 units for trades while also lowering leverage to 10:1. Doing so meant that customers by default required account sizes in the five figures to trade. Even though the US’s retail industry has been restricted, Niv pointed out that volume data is showing that traders are favoring spot FX over exchange traded FX futures. 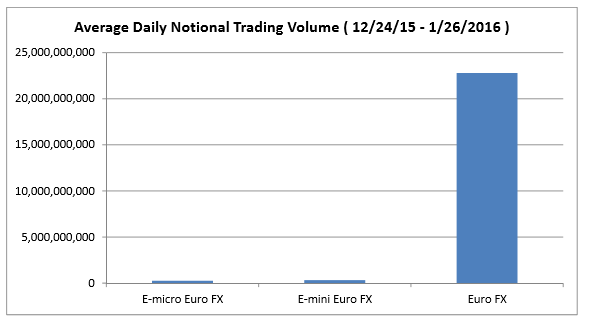 This was illustrated by a chart that FXCM presented in the research’s FAQ that compared E-Micro and E-Mini future volumes to the standard Euro FX futures contract. As seen above, while average daily volumes of the standard contract were around $22.5 billion between December 24, 2015 to January 26, 2016, E-Micro and E-Mini volumes were just 1.1% and 1.4% respectively of the larger contract. According to Niv, the smaller contracts are those expected to be used by retail traders, with the lack of volume showing minimal retail participation in the FX futures market. Niv summed this up by saying that “customers are coming to us (and other retail brokers) because we are all cheaper”. Few good points have been made. Thanks! The CEO of one of the most famous and outrageous bucket shops strikes again! Futures have less settlement risk for which you clearly have to pay a premium. I would be interested to know how FXCM accounts for all the credit lines it gives out on its balance sheet should you get the opportunity to ask Drew again. Drew is probably the smartest guy in the industry and definitely the most successful and capable CEO of any FX Brokerage. My hat off to him! I would probably rate CEOs who didn’t nearly bankrupt their companies more highly such as Gain, IG and CMC and I’m not sure FXCM shareholders would agree. His timing was right when he launched FXCM and he marketed the company well but as is often the case he doesn’t understand risk. You can outperform your competitors by taking more risks but eventually that catches up with you, as it did. He might be battling with the CFTC to keep the retail industry alive in the US but that’s just so he can take their money through his B book. Retail FX is a very small part of the FX industry and Drew isn’t a great example. He bankrupted his company taking on too much risk with the EURCHF and then didn’t learn his lessons so he did it all again with Fortress Prime. He reflects how our industry is but that isn’t necessarily a good thing.